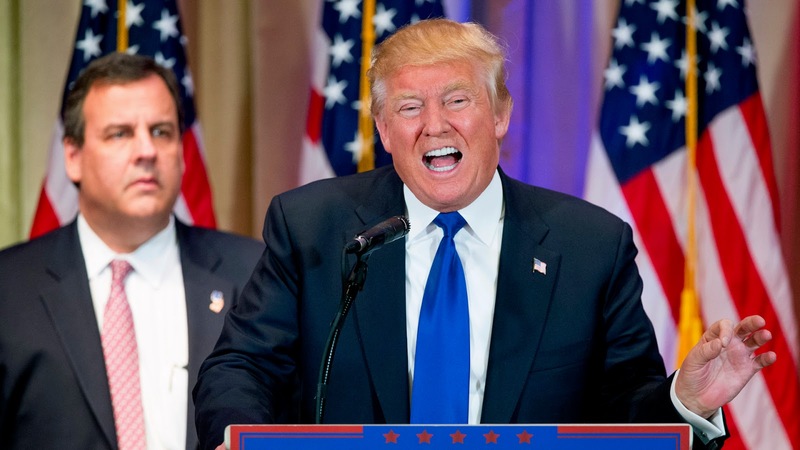 Chris Christie, like all bullies, is a pathetic figure. 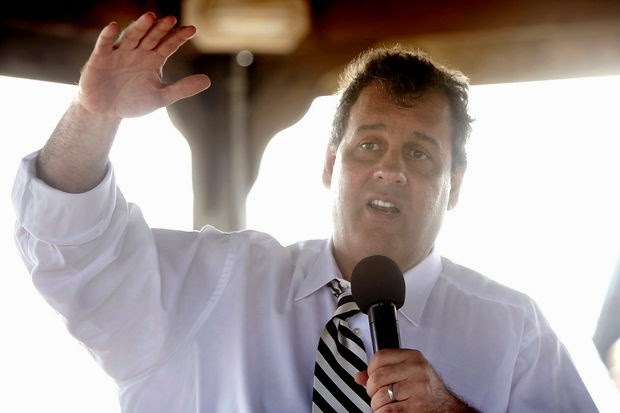 Christie has approval ratings so low -- 19 percent! -- they are even worse than Donald Trump's. The current leading Republican candidate for governor, Kim Guadagno, has completely disavowed Christie, going so far as to openly mock him -- and she's his lieutenant governor. He was fired from his job of leading Trump's transition team, reportedly because he wasn't doing any work. He then couldn't get a position within his own party at the national level, going so far as to blame his wife for being left out of the biggest power grab the Republicans have had in decades. Denzel Davis, a sophomore at Trenton High’s STEM school who is ranked first in his class, asked Gov. Chris Christie if he has a plan to improve education. 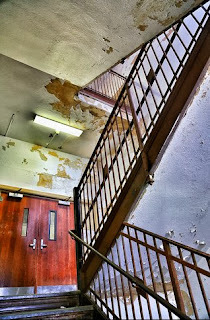 The response the student received Thursday afternoon during the governor’s visit to the 9th Grade Academy in Trenton was spent mostly on bashing teacher unions. However, in addition to the three Trump campaign sources who spoke to Yahoo News, two junior staffers also described specific instances of alleged mismanagement by Christie that got the transition off to a slow start. The two staffers said Christie did alarmingly little work on the transition and was largely absent from the campaign during the weeks leading up to the election, when Trump was widely expected to lose. According to one account, campaign staffers had been so accustomed to Christie’s absence that they were surprised to see him appear at campaign headquarters in Trump Tower — on Election Day. “Where was Christie? Where was he? He certainly wasn’t planning the transition. We [didn’t] have nearly as much planning as we should have,” one of the staffers said. On election night, the high-level source and the two staffers said many members of Trump’s team did not know where they were supposed to go the next morning. The high-level campaign source described this as one of many examples of a lack of transition planning from Christie. Of course, Christie's people denied this. But how could it not be true, given Christie's work record over the past couple of years? In July of 2015, The Asbury Park Press reported Christie had been absent from the state 230 days since the beginning of 2014, when he started his run for president. The Wall Street Journal reported Christie was gone 72 percent of the year in all of 2015. Not only was this bad for the governance of the state; it cost New Jersey taxpayers millions for Christie's security. But Christie's poor attendance record hasn't only suffered from his campaign work; he's been a regular on sports radio* over the past year, hinting he'd like to get a permanent gig after he leaves the Statehouse (why any station in this market would hire a Cowboys fan is beyond me). And yet here he is knocking teachers yet again about "how much they want to work or don't work" -- in front of a group of students, no less. For the hundredth time: Teachers do not get paid during the summer. Every year, teachers are forced to take an unpaid furlough in July and August. Chris Christie seems to think teachers should work during these months for no additional pay; if he thought otherwise, he'd have come up with a serious proposal to compensate teachers for their increased hours. He'd also have a serious proposal to upgrade every classroom in the state so teachers and students wouldn't be working in dangerously hot schools under conditions he would never, ever tolerate himself. We know the teacher pay gap nationally is wide and growing. New Jersey pensions are among the stingiest in the nation, and New Jersey teachers' health benefits are not any great bargain compared to the private sector. Christie even provided the dozen Trenton students in attendance an example of why he favors a merit-based system. You'll note that Christie gives no actual example of this happening. Nor does he acknowledge that teacher layoffs may be occurring because, for his entire term, he has refused to fund schools at the level the state's own law says he should. Nor does he tell these students he wants to slash funding to their own school district, even though its local citizens make just as much effort, if not more, to contribute to the funding of its schools as do the wealthiest districts in the state. Chris Christie pretends he understands business. 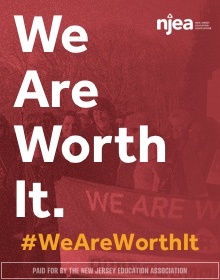 But every business owner knows that if you want to attract the best people to join your workforce, you have to pay them competitive wages and give them good working conditions. And yet, for years, Trenton's students and teachers had to endure a disgusting, unsafe environment. 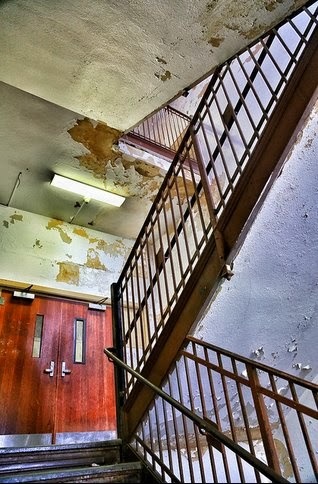 Trenton Central's infamous "Waterfall" staircase. Now he swoops in to take credit for a new high school in Trenton, even though he ignored the problem for years. And even though the new school will almost certainly not be built if his insane "Fairness Formula" ever passes (it won't). Trenton Education Association (TEA) President Naomi Johnson-Lafleur questioned why the governor did not bring up his “Fairness Formula” proposal to the students, which would significantly cripple urban education. “What he should have done was gone inside and said, ‘My name is Chris Christie and I’m a racist because I do not want dollars from the affluent areas to come to help you poor children,’” the union boss said. “He should have said, ‘I’m going to shortchange you. 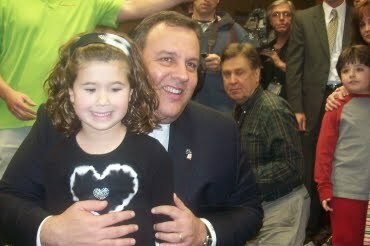 I’m going to have this photo op with you now so I can put it in the paper and I can boost my 17 percent popularity rating to maybe 25 percent.’” In June, Christie rolled out his plan to equally spend $6,599 on each student to lower property taxes in suburban areas. During the announcement, the governor repeatedly targeted the capital city’s “failing” school district as to why a formula change is needed. Christie intends to take his fight to the state’s Supreme Court. Janice Williams, TEA’s grievance chair took issue with Christie criticizing teachers in front of the students. ... while ignoring his responsibilities toward funding their education. And he has repeatedly blamed teachers for his own miserable failings. It took a while, but New Jersey has now seen through his mendacity and ignorance, and has thoroughly rejected him. Just go away, Chris. We're done with you. I'm not going away -- I have no where else to go! Yes, he's on the radio until 10:00 AM -- when all of New Jersey's teachers are in their classrooms doing their jobs. And it's not like he's talking with his constituents about the issues facing the state; he's making fun of Ben McAdoo's hair and denigrating Eagles fans, many of whom live in South Jersey. 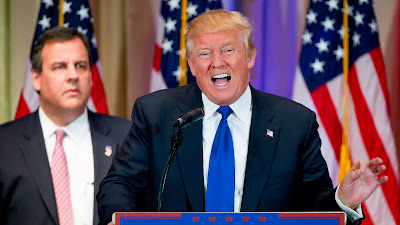 Little did we know that Christie was the precursor to Trump The Terrible. Both experts at trashing and demeaning our public schools where 85%-90% of the kids are educated. It's always open season on public school teachers, the national punching bag, especially the unionized teachers. The next 4 years will be crushing for the real public schools. I think NJ will probably weather the storm better than most states especially if a Democrat wins the governorship. Not that Democrats have been good for public schools. Cory Booker is a total sellout to the school reform agenda but he's not as nasty or vicious as Christie. I'm not really certain of Phil Murphy's stance on charter schools but at least he's not an anti union cheerleader. Wow. This is a must READ! I need to share. One thought came to mind as I was readg the beginning of your blog...If he wasn't THERE & wasn't HERE, where was he???? The law that makes union membership mandatory also makes true representation of educators impossible. NJEA will not bite the hand that's feeding it. Attack the law. Take back your union.